I thought I would post this entry because I purchase bulk foods quite often. The problem is when you go to your local Bulk Barn or ethnic grocery it is highly unlikely you will find measuring cups. It's become a touch annoying. You need to purchase 1 cup of rice, or 2 cups of specialty flour, or the like. What do you find to measure your purchase? It's usually a scoop (or in the case of our local Chinese grocery, a plastic Coke glass). I can't recall a single recipe that calls for 1 coke glass of anything. Most often the items you're buying are not standard pantry fare, which is why you're shopping bulk in the first place. You try your best to get only what the recipe calls for but when you get home you either have slightly too little, or too much. You end up with bag after bag of unnecessary remnants. Little bits that hang around and clutter up your cupboard, and life. No more, I say! I'm going to purchase a set of collapsible measuring cups and keep them in my glove box. Weird I know, but a practical solution. When required, I'll simply take the one I need and slip it into my pocket. Then I'll always be able to buy just the right amount. 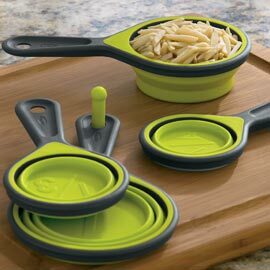 Over the past several years there has been an upsurge of collapsible cooking utensils, like strainers, bakeware, bowls, etc.. Very practical solutions for the urban kitchen. We have a collapsible dog water bowl, which incidentally already lives in the car. The measuring cups are widely available. I often see them at our local Winners/HomeSense discount stores for a price in keeping with where I'll be storing them. If my frustration continues, there may also be collapsible measuring spoons in my future. How many cacia berries does someone actually need to have on hand? Not many, I would posit. If you like this post feel free to retweet with link at top, or share it using any of the links below this text.